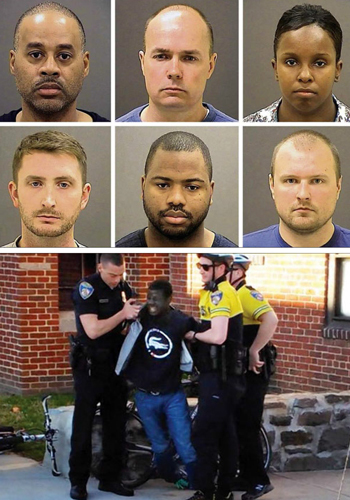 Baltimore state's attorney files unprecedented indictment against 6 police officers as efforts to obtain justice for Freddie Gray move forward and the nation sees a different side of the legal process. “No one is above the law,” she declared May 1. She listed charges against Officer Caesar Goodson Jr., 45: Second-degree depraved murder, manslaughter, second-degree assault, two counts of vehicular manslaughter charges and misconduct in office. Officer William Porter, 25: Involuntary manslaughter, second-degree assault and misconduct in office. Lt. Brian Rice, 41: Involuntary manslaughter, two counts of second-degree assault, two counts of misconduct in office and false imprisonment. Officer Edward Nero, 29: Two counts of second-degree assault, two counts of misconduct in office and false imprisonment. Officer Garrett Miller, 26: Two counts of second-degree assault, two counts of misconduct in office and one false imprisonment charge. Sgt. Alicia White, 30: Involuntary manslaughter, second-degree assault and misconduct in office. The officers charged have been released on bonds of between $250,000 and $350,000. “For the average citizen there would be no bail,” said defense lawyer Warren Brown. The announcement, less than a day after receiving the police department’s criminal investigation and official autopsy results, took the city by surprise. So too did her detailed description, based in part on her office’s independent investigation, of the evidence supporting probable cause to charge all six officers with felonies. 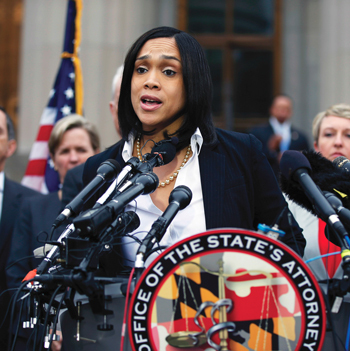 The police had no reason to stop or chase after Mr. Gray, Ms. Mosby said. They falsely accused him of having an illegal switchblade when in fact it was a legal pocketknife. The van driver and the other officers failed to strap him down with a seatbelt, a direct violation of department policy, and they ignored Mr. Gray’s repeated pleas for medical attention, even rerouting the van to pick up another passenger. “This is a small step toward justice.” There is still a long way to go and people have to stay interested and engaged. The officers missed five opportunities to help an injured and falsely imprisoned detainee before he arrived at the police station no longer breathing, Ms. Mosby said. The Fraternal Order of Police started howling about the charges and mounted a campaign picked up by White daily media questioning the decision and charging a conflict of interest because Ms. Mosby’s husband is a city councilman who represents the area where the Gray death occurred. The charges of bias and unfitness lodged against the youngest major city prosecutor in the country are all the more ludicrous because she comes from a law enforcement family. Her mother and father were officers as was her grandfather and several other family members. The actions of rogue cops taint the work of good officers and the charges are against six individuals not the entire department, she said. Ms. Mosby rejected the police union request to step aside and appoint a special prosecutor to handle the case, and said honorable police officers should have no problem working with prosecutors in Baltimore. Mr. Gray was stopped by police in Sandtown, a poor, overwhelmingly Black neighborhood in West Baltimore. He locked eyes with a police officer and then ran. Two blocks later, they pinned him to the sidewalk, handcuffed him and dragged him into a transport van, a scene captured on a bystander’s cell phone video and shown around the world. Ms. Mosby said the police review, the autopsy and her own office’s investigation all point to homicide. The officers were booked on charges ranging from assault and manslaughter, carrying 10-year prison sentences, to second-degree “depraved heart” murder, which could put the van driver in prison for 30 years if convicted. The cash-strapped city has paid millions of dollars in settlements in recent years for officers accused of misconduct and spent millions more defending officers. Expensive settlements for police harassment, broken bones and abuses have been paid, but few police officers have been arrested, said Dr. Ray Winbush, director of the Institute for Urban Research at Morgan State University in Northeast Baltimore. 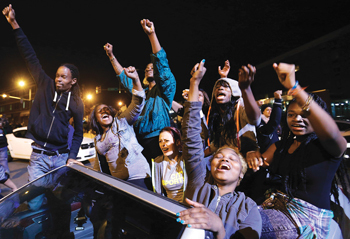 Demonstrators celebrate the announcement of six officers charged in the police-custody death of Freddie Gray before a curfew goes into effect May 1, in Baltimore. Officers know the city will settle with victims but they won’t be fired, said Dr. Winbush. Suspensions with pay amount to a vacation for officers, he added. The officers involved in the Gray incident should have been arrested because a spine doesn’t sever itself, clearly something illegal happened, he added. Blacks have long complained of abusive policing in Baltimore and across the country. Their complaints have usually gone ignored or dismissed. Malik Shabazz of Black Lawyers for Justice applauded the decision to charge the officers. Ms. Mosby took the right action and is a strong Black woman, he said at a May 2 downtown rally. Unlike other major cities grappling with police killings, Baltimore’s mayor, state’s attorney and police commissioner are Black, like the majority of the city’s population. Three of the officers charged in the case, including the van driver, are also Black, according to online court records. The other three are listed as belonging to the broad category of “White, Caucasian, Asiatic Indian, Arab,” without further elaboration. The decision to charge the officers brought celebrations throughout the city as residents felt finally there was hope for justice. “What Marilyn Mosby has done is symbolic of how state’s attorneys around the country ought to conduct their independent investigations and let the information go forward, which allowed her to bring the indictments against the six police officers,” said State Senator Catherine Pugh, who represents Baltimore in the Maryland legislature. “I think we become a model for the injustices so many African American males in the country, and people of color, had extended to them by police officers,” she added. Racial profiling and expensive mass incarceration become topics of discussion now, said Sen. Pugh. There is a need for more cultural diversity and psychological testing to show they can properly preserve and protect neighborhoods, she added. “At the end of the day we want justice, Baltimore City police are very corrupt, it has been going on for years. This didn’t just start today,” said Massieka Holness, who was standing at the intersection of North Avenue and Pennsylvania Avenue, the center for protests and unrest, with a sign praising the state’s attorney. There are 11 members of the state’s attorneys’ family who are involved in police work and the family was in Boston, said Min. Don Muhammad of Muhammad Mosque No. 11. The family was always very strong toward law enforcement and people who appreciated the Nation and Minister Louis Farrakhan, who was here many years ago, said Min. Don Muhammad of the Boston mosque. The attacks from the Fraternal Order of Police are to be expected and every Black man should feel hurt and defend Black women, especially women in positions of authority usually held by men, he said. Student Minister Carlos Muhammad of Muhammad Mosque No. 6 lauded the state’s attorney’s decision. 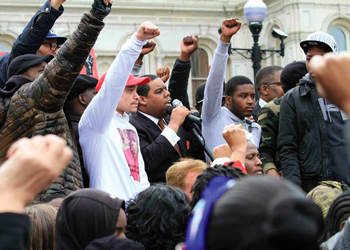 Ms. Mosby made the right and courageous decision, said the Nation of Islam representative in Baltimore. But, he added, “this is a small step toward justice.” There is still a long way to go and people have to stay interested and engaged, said Min. Muhammad.